The Cross 101 weighted vest is one of the best for using it in various training workouts. You will find that it’s a best seller and you can buy it in various weight models. It’s sturdy and has plenty of room in the shoulders. In a hurry? ==>> View the best price and reviews on amazon. The cross 101 is one of the best weighted vests that you can use for exercise and adding resistance to your workouts. Even more so it’s great for muscle building exercises for your legs, push-ups, chin-ups, sqaut jumps, long walks and pull-ups. The CROSS101 Adjustable Weighted Vest is our top choic and part of the reason for this is because it is the bestseller on Amazon.com. It gives you a 40 pound adjustable weighted vest so you can use this as a beginner and simply use it with less weights or if you are advanced you can use more weight and fits really snug so it does not get in the way. Weights Included. 10 x 4lbs Iron Ore weights. Weights are adjustable in 4lbs Increments. Max weight is 40lbs. One size fits All. Manufacture warranty included. ONLY 13″ in width and 15″ in length. The CROSS101 Weighted Vest is a great way to add resistance to your workout and it has all of the weights included where you will be able to use 10×4 lbs iron ore weights to accommodate the exercise you are doing. This means as we mentioned above that you can select the exact weight you want to use depending on the exercise you are doing. If you want to do a run, you could remove the weight so you are really light. If you wanted to do box jumps, you can easily add more plates in in seconds. It’s really that easy to adjust the weight. 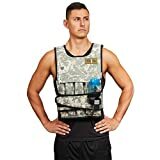 The Max weight of this vest is 40 pounds which is quite heavy and that should be enough for most beginners to intermediate people that are using a weighted vest. If you are purely going for muscle building you may require a bit of a heavier Vest like theRunFast Vest which goes up to 140lbs. The other great thing about this product is that one size will fit all and is very comfortable you simply need to tighten the straps and you will find that this gives you a brilliant weighted vest which is not too bulky. The shoulder and neck area are fixed so you can’t adjust the tightness of it. In order to keep it snug you want to tighten the velcro around your waist. This is also a one-piece design which makes it easier to use for your workout. You will find it simple to add the weights on as you see fit as there is compartments in the front and the back. What is unique about this vest is that the 4.4lb weights are mini bags of sand. So, nicely conform to your body and they are really easy to take out or add. Each pocket has a velcro cover on top to ensure the weight does not pop out. You will also find that this is only 13 inches in width and 15″ inches in length, so it does keep the bulkiness down which is great if you are looking to do and active work out with one of these vests. Pro Tip: When you are loading up all 40 pounds of weight, trying putting it on laying down on the floor, rolling over to your knees and then stand up. It’s a lot easier to get it on and you won’t bang your head when putting it over your head standing up! Looking at the customer reviews it has some really good feedback with most people rating it five stars and most people say that the cost of this vest is very good and it will give you a fantastic weighted vest that you can use and is very similar to a military combat vest they use in marches. You will also find that this is easy to get on and off and the any downside is that we could see is that one review mentioned that the weights can slide down your body if you are jogging with this which can be annoying and there is no padding around the neck will shoulders so you may find that if you are using this for long periods it gets a little bit uncomfortable! I would definitely not recommend this for runners. It really was not designed for it. Go for something like the Everlast Weighted Vest here instead. However for the price, for the features and for the quality of this weighted vest this is well worth a look by clicking the link below! Click here to check out the CROSS101® – 40Lbs Adjustable Weighted Vest at Amazon.com.